March 27, 2018 — On April 3, Maryville and the Chicago Bears will honor Kyle Long with the 2018 Ed Block Courage Award for his efforts to support victims of abuse, violence and neglect. For 40 years, the National Football League has given the award to recognize players who are role models on the field and off. 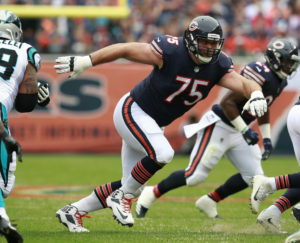 Kyle Long, 29, a guard, was selected in 2013 by the Bears with the 20th overall pick in the NFL Draft. Kyle is the son of Pro Football Hall of fame defensive end Howie Long and the younger brother of Philadelphia Eagles defensive end Chris Long. Every year, the players on each NFL team select a teammate to receive the award. The Ed Block Courage Award recipients are regarded as symbols of professionalism, strength, and dedication. The winner is considered to be a role model in his community and a crusader for victims of abuse, violence and neglect. The Ed Block Courage Award benefits the Ed McCaskey Scholarship Fund which donates to high school, college and vocational scholarships for the children of Maryville. The scholarship is named for Bears vice president and treasurer and longtime Maryville supporter Ed McCaskey. The luncheon will be held Tuesday April 3, 2018, 12:30 pm, at the Manzo’s Banquets, 1571 Elmhurst Rd., Des Plaines. For more information go to MaryvilleAcademy.org.